Our objective is to insert this DNA construct into both E. coli and Bacillus subtilis to secrete proteins, which will fluoresce red and selectively bio-tag to PET plastic. We based our construct design on Tianjin’s 2016 PET-ase construct for the biodegradation of PET plastic. We modified this construct with the help of our mentor Lisa Oberding from Fredsense for this specific project. We need to pay huge attribution to our mentor Lisa who designed our construct and did many rounds of troubleshooting so we could finally get these parts synthesized. We chose Bacillus subtilis because of its natural ability to produce hydrophobins, and because when compared to E.coli, it is much better at naturally secreting proteins. The four constructs we designed for lab work all consist of two transcription terminators, a Bacillus-specific promoter, a ribosome binding site, which starts the formation of protein, and a LipA, which is a secretion tag that will help send the protein outside the cell. The parts we submitted to the registry are optimized for use in E.coli and are in the standard pSB1C3 backbone. Any teams wishing to get the sequences for Bacillus specific plasmid vectors are welcome to reach out to us for the sequence! This construct is essentially our first construct, with the exception of the part mCherry. Following the transcription terminator is the Bacillus promoter, the ribosome binding site which starts the formation of the protein and the secretion tag SSLipA which is fused with the PET-ase instructing the Bacillus subtilis to secrete the enzyme PET-ase out of the bacteria. But in this construct, the part mCherry is included. The reason mCherry is present in the construct is to be an RFP or red fluorescent protein which the color aspect in the bio-tag. This is also part of the construct to essentially fluoresces when the construct sticks to PET plastic. Following the mCherry is our modified PET-ase (part BBa_K2650002). But between the mCherry and PET-ase part is a linker. The reason for adding a linker is to put space between each part to make sure they do their function without crushing each other or inhibiting each other’s functions. Following the PET-ase is the second terminator of the construct to ensure there is an end for the protein and it is not continuous. This construct has the same base as all of the other constructs (2 transcription terminators, Bacillus promoter, and the ribosome binding site), but this construct has the addition of mCherry and hydrophobins (BsIA)(BBa_K2650003) which is also a composite part. At the start of the construct is the first transcription terminator followed by the Bacillus promoter and the ribosome binding site. After the ribosome binding site is the secretion tag SSLipA and the BsIA (hydrophobins). After the BsIA is a linker between BsIA and the mCherry. The linker is in the construct to ensure that their functions are not inhibited by each other and to allow correct folding. Followed by mCherry is the second transcription terminator to end the process. The purpose of this construct is essentially to test the fluorescence of the mCherry and whether adding hydrophobins will help with the adherence/its binding properties, to the PET plastic. This construct consists of two transcription terminators, a promoter, a ribosome binding site, and our optimized DNA coding region for the PET hydrolase enzyme. At the start of the of the construct, there is the first transcription terminator followed by a Bacillus subtilis promoter. The reason the B. subtilis promoter is in the construct is due to the fact that the DNA construct will go into Bacillus Subtilis because of its natural ability to produce hydrophobins and it is better at secreting proteins compared to the traditional E-Coli. Following the Bacillus subtilis promoter, the next part is a ribosome binding site and a SSLipA secretion tag. The SSLipA is added to the construct as it signals to the bacteria to secrete the proteins. Following this part is our modified PET-ase part that was originally the construct used by the Tianjin IGEM team. PET-ase is the construct that is used to degrade PET plastic, but we are using it for its binding properties to PET plastic. Finally, we the other transcription terminator which cuts off the whole process. Our final DNA construct is essentially the same as our first construct with the exception of BsIA (BBa_K2650004) included in this construct. 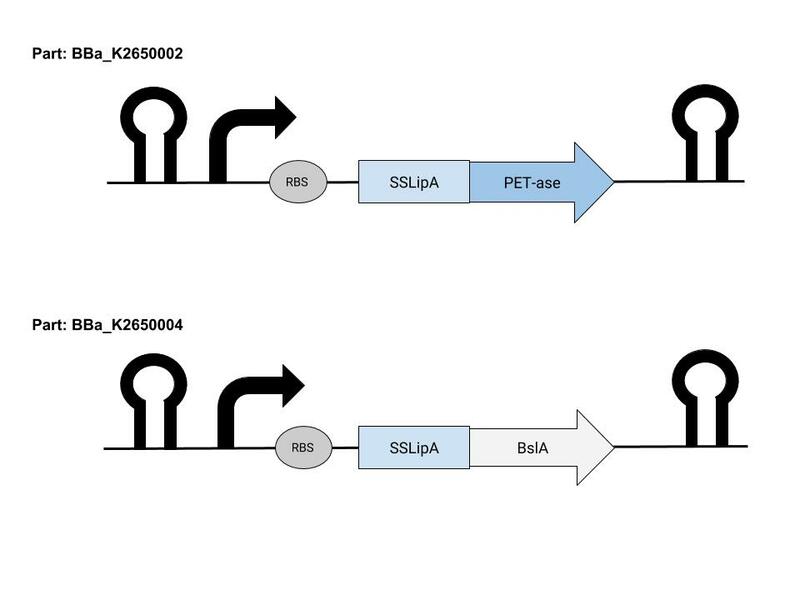 The construct starts off with the first transcription terminator followed by the B.subtilis promoter and the ribosome binding site and the SSLipA secretion tag. Following this is the composite part BsIA. The BsIA is essentially a hydrophobin. Its reason for being in the construct is to act as an adhesive of binding protein to ensure that our construct binds with the PET plastic. Also, it helps enhance the PET-ase enzyme to stick to plastic more effectively as well. 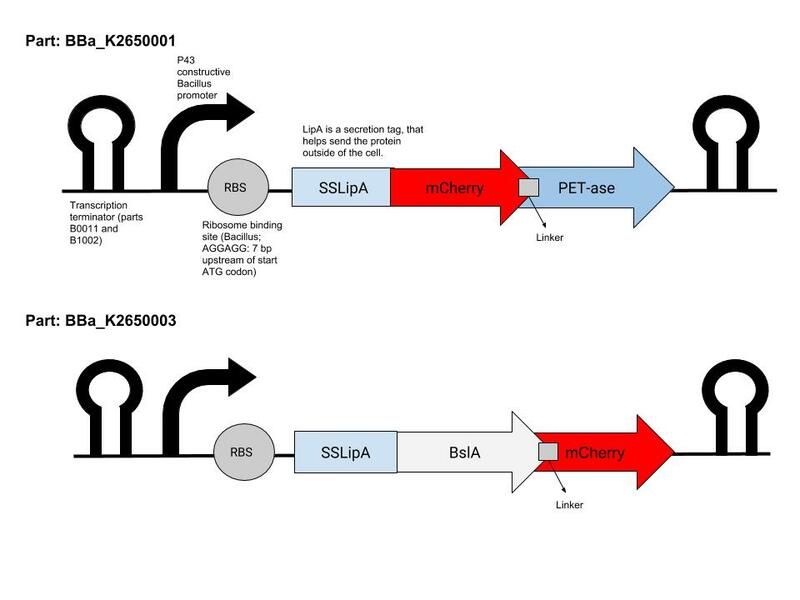 Following the BsIA is the second transcription terminator to ensure this process stops. It should also be noted the Bacillus Subtilis, the bacteria in which our DNA will be secreted in naturally produces hydrophobins as well.